Chickweed tea is a great natural remedy that made from an herb that is often overlooked and even discarded. Your garden may hold the key to a wonderful tea that you may use both internally and externally to treat many ailments. Come and learn how to make a tea that clear and treat your skin or detoxify your organism from the daily toxins we all let enter our bodies. Let's have a cup of a healing tea. From the Latin stellaria media, chickweed is a weedy plant native to Europe and Asia, but may be found in gardens all over the world, growing all year-round, even resisting wintery frosts. Chickweed goes by other names such as: adder's mouth, mouse ear, satin flower, tongue grass, chick wittles, star weed or winter weed, stitchwort and chicken wort. This herb got its common name of chickweed because the seeds were used as bird feed for a long time. It has strain green stems that can reach the length of 40cm and grow along the ground, creating roots when it meets with soil, spreading quickly. Its many leaves are small and succulent, much shaped like an egg, with a light green color. Chickweed bears small white star-shaped flowers during the spring and summer months. These flowers are really special, having five petals, each dividing into two parts giving you the illusion that the flower actually has ten petals enhancing the star-like effect. Chickweed herbal tea has been used as a herbal remedy since the 16th century helping to treat respiratory problems as well as skin diseases and inflammations. Taking this tea internally would be recommended to those with poor digestion and even to those suffering from tuberculosis. Today, chickweed is still used as internal herbal tea, but it may also be made into ointments to help heal skin conditions. As a herb, it may also be enjoyed fresh in a nice summer salad, helping to stimulate digestion and metabolic rate. You can actually collect at any time of the year and add it to your dishes. It may at times have been considered a nuisance and a weed, but the truth is that chickweed is a source of many minerals and vitamins. It contains vitamins A, B-complex and C, ascorbic acid, flavonoids, coumarin, calcium, potassium, iron, magnesium, silicon and zinc making each cup of this tea a very nutritious beverage. This herbal tea has long been used as a cooled poultice to treat skin issues. It may help to treat acne as well as other more serious ailments such as psoriasis and eczema. Chickweed is said to clean and heal the skin. You may use this tea externally to treat skin irritations, sores, rashes, cuts, boils and burns. Using a clean cotton ball you may apply this cooled infusion to your eyes to relieve possible eye inflammation, conjunctivitis or general eye exhaustion from the use of contact lenses. Why not add chickweed tea to your bath water to make a cooling and soothing bath? It may help with inflammation and redness on your skin, nourishing and cleansing it. It may treat ulcers and abscesses a little faster. Torn ligaments, swelling and joint pain can greatly benefit from applying chickweed herbal tea to the affected area. It may help bring down the inflammation and speed up the tissue healing process. Tip: blend with aloe vera for a nourishing and moisturizing infusion, which will treat all layers of your skin, removing pain and speeding up healing. Drinking chickweed tea on a regular basis may benefit you by helping to detoxify your system. This herbal infusion is said to cleanse the blood even going to the extent of aiding in the treatment of blood poisoning. Chickweed tea may help purify the blood removing excess plaque in the blood vessels along with other fatty substances. This may be helpful to prevent heart attacks and stroke, but it does also have some blood clotting action, so if you have previous heart disease, speak to your doctor prior to taking this tea. This herbal tea may stop bleeding in the stomach or bowels, but if you are experiencing any of these symptoms, you should see your doctor as quickly as possible to find out if you have bleeding ulcers or irritable bowel syndrome. A cup of chickweed herbal tea on a daily basis may be helpful to promote weight loss. It does this by helping to curb your appetite, controlling your urges to eat unhealthy and unnecessary foods. Drinking this tea regularly may stimulate your digestion and boost your metabolic rate increasing your nutrient uptake. Along with its laxative action it may aid your body in ridding itself of unwanted wastes, which may ultimately lead to excessive fat loss. This herbal infusion also has diuretic benefits, which could help your body rid itself of excessing water accumulated in your system that could be causing both bloating feelings and weight gain. Even if you don't have weight loss as your goal, this tea could be used to improve your digestive process as a whole, helping to relieve flatulence and constipation, reducing stomach or bowel pain. This herbal tea may help to relieve stress and tension. It may be soothing for your nerves as well as your mind, reducing general irritability and hyperactivity. If your nerves have caused to suffer from ulcers, contact your doctor and if he/she agrees, consider a cup of this tea to help soothe and treat your ulcer. Take a cup of chickweed tea when start experiencing the first symptoms of a cold. It may dissolve mucous that is causing congestion, it may also help treat coughs and bronchitis. If you have a fever, this tea may help bring your temperature down. This infusion may also strengthen your throat and lung membranes, clearing bacterial infection or inflammation, easing breathing and helping with other lung illnesses, asthma and even respiratory difficulties caused by asthma and smoker's cough. Tip: Add honey to improve this tea and help your respiratory disorders. It may even taste better than some cough syrups and work as a great expectorant as well. This herbal tea is considered anti-inflammatory and therefore may help soothe joint inflammation and relieve rheumatism, gout and arthritis. Its natural sedative action may relax your muscles and take away the pain. A cup of chickweed herbal tea may help treat infections in your kidneys and liver, relieve the pain of a kidney infection or cystitis. In the process it may even strengthen your kidneys and liver to prevent future ailments. If you have irregular menstruation, then consider drinking this herbal tea to help regulate late periods as well as reduce the pains association with your menstrual cycle. Would you like try chickweed tea now? Despite the numerous ways in which chickweed herbal tea may help you, there are some side effects that you should be aware of. If you pregnant or breastfeeding an infant, it is best not to drink this tea. Speak to your doctor about an alternative to chickweed. If you suffer from chronic heart disease, you should then avoid this tea due to its possible effects on your circulatory health and possible interactions with your medication. Excessive chickweed tea may lead to vomiting, diarrhea and in worse cases of really high doses even dizziness and fainting. If you experience any discomfort or symptoms such as headaches or weakness, stop taking this tea and speak to a doctor. One of the benefits of this tea is its diuretic action, but if you take too much of chickweed herbal tea, you may become dehydrated and this could lead to more serious imbalances. If you suffer from previous heart disease and need to take medication to prevent blood clots, then you should seek the advice of your doctor prior to taking this tea, as it does affect the natural flow of your blood. Unfortunately, some people may experience common allergic symptoms when using fresh chickweed because its pollen is a common allergen. 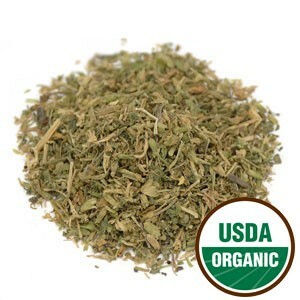 You may wish to try dried chickweed instead as the probability of allergy may decrease. If you are prone to allergies, start with very small doses to test your reaction on a small area of your skin. Now let's take a look at how to make chickweed tea. You can make this tea using either fresh or dried chickweed, but the fresh herb is considered to make a more effective tea. Begin by filling your kettle with fresh water. Bring water to boiling point (100ºC). While you wait, prepare your teapot and cups. Place 1 teaspoon of dried chickweed or 2 teaspoons of fresh chickweed per cup of water (about 250ml) into your teapot. If you are using the fresh herb make sure to cut or bruise the leaves to release both flavor and healing properties. Tip: Not sure how many cups of water your teapot holds? Then before heating the water, use your teacup to fill the teapot, once the teapot is full pour the water into the kettle and heat it. Once the water is boiling, pour it into the teapot and let your herbs steep for 5 to 10 minute. Strain your tea and serve. Your tea should show a color somewhere between a light yellow and amber, depending on how strong you made your tea. You may wish to add honey to sweeten your tea, but chickweed tea already a pleasant mild flavor that you may enjoy. It is best to drink this tea while it is hot (not boiling, mind you), but it's best to keep to the recommended 2 to 3 cups a day for about 6 weeks. Chickweed tea may be made into an iced tea, but for healing purposes, drink it hot. You can collect chickweed herb throughout the whole year, but it is at its best in spring and summer. You may then dry it by tying a bundle with a string and then hanging in cool and airy place to dry. You may eat chickweed in your salad as a fresh or steamed vegetable with a flavor that resembles cooked spinach. For an herbal poultice, boil the herb and then allow it to cool. Put the herb in a thin cloth that you may apply to your skin. Leave it on for a few cooling minutes or up to 3 healing hours. As the poultice warms up you may discard it, the rising temperature is a sign that the chickweed's job is done. it has a healing and soothing action. Buy Your Chickweed Tea Today! Click on the image or on the link below to purchase from Starwest Botanicals your Organic Chickweed. Start your healing process with chickweed herb, either cut and sifted or in powdered form. Enjoy a warm cup of tea when you are feeling down or make a cool compress to treat inflammation before it spreads. Buy your Chickweed tea now! In conclusion, prepare a cup of chickweed tea when you need an internal or external cleanser. This is a wonderful herb that does not deserve to be called a weed, don't you think? Enjoy a cup of chickweed tea!